Ever since I was a kid, supper has always been a weekly thing for me. 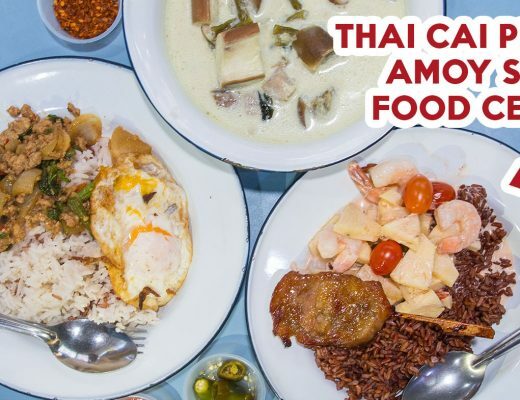 Upper Thomson is just five minutes away from my house, so it’s usually where I head to for a quick fix, especially when prata or nasi goreng cravings hit. But if I feel like having bak chor mee, I’d willingly travel further to the famous Bedok 85. For those who are unfamiliar with Bedok 85, it’s a hawker centre – that’s officially called Fengshan Centre – at Bedok North. 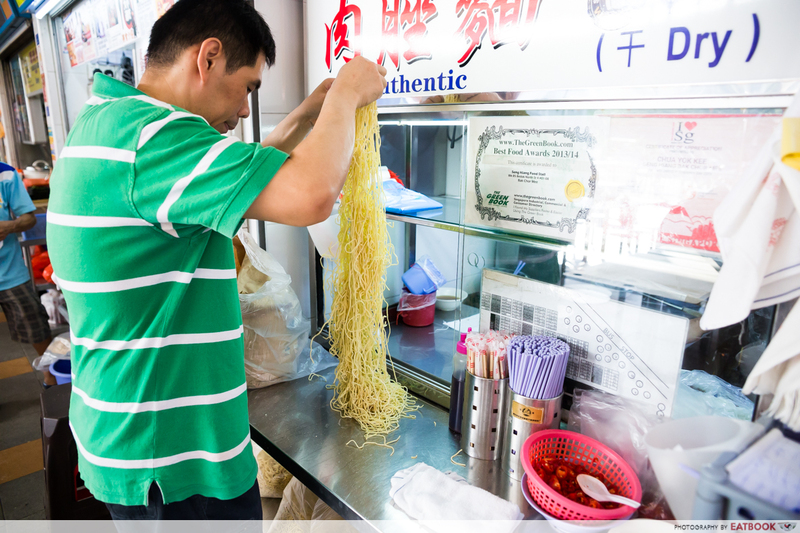 It’s home to plenty of delicious grub, but it is most famous for their soup-based bak chor mee. 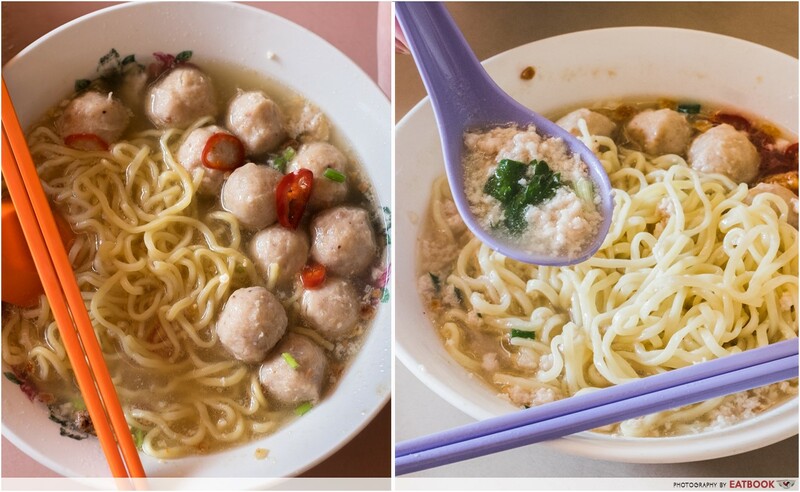 There are two stalls, Xing Ji Rou Cuo Mian and Seng Hiang Bak Chor Mee, selling the same type of bak chor mee side-by-side, and they’ve confused the crowd for decades – which is the OG Bedok 85 bak chor mee seller? We decided to stop the guessing and speak directly to the owners of both stalls to find out what they have to say. Xing Ji Rou Cuo Mian was started by Mr Sim Geok Him in 1968. 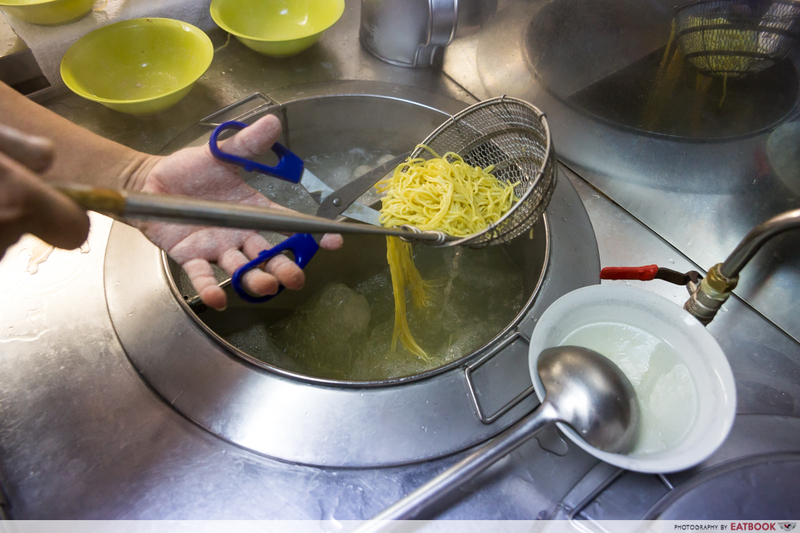 The bak chor mee business first took the form of a pushcart around Simpang Bedok, and it moved to a permanent stall at Fengshan Centre under governmental orders in 1977. The stall was then passed down to his children, followed by his grandchildren, Mr Yap Tiong Chye and his elder sister. They sell around 300 bowls of noodles a day. 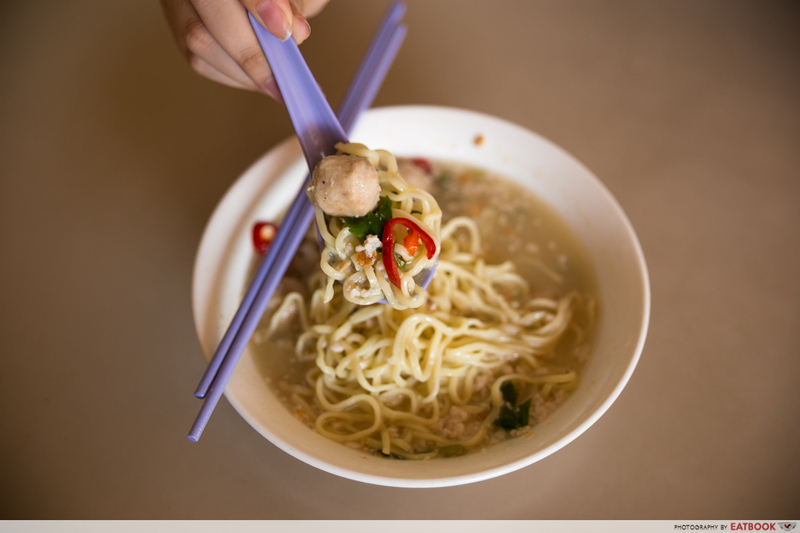 When asked about their competitor next door, the owners say Seng Hiang Bak Chor Mee moved to Fengshan Centre at the same time as them. “In the morning, they sold you tiao (fried dough fritters), then at night, char kway teow. 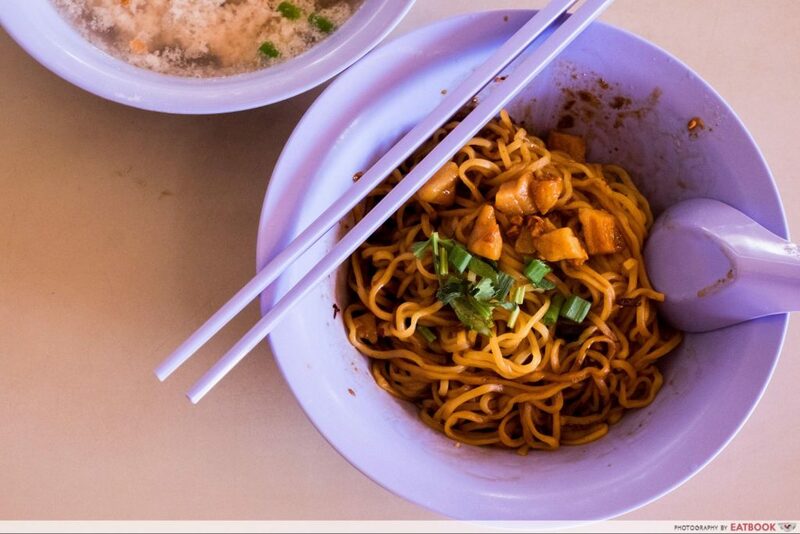 Char kway teow had no business, so they decided to change to selling bak chor mee,” said Mr Yap in Mandarin. The siblings do not see the need to prove to customers that they are the original. Instead, they focus on continuing with what they do and taking care of their health. “At this age, to be honest, health is more important. Now we take things less seriously. If you want to fight [for the title of being the first], you can fight. 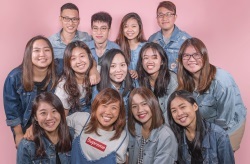 I just do what I’m supposed to do,” said Mdm Yap. “Many customers think it’s them. Many people have misunderstood, but it’s okay. People say what they want to say. It’s up to them to discern, and eat what they want to eat,” she added. Profit isn’t the siblings’ main motivation when it comes to running this hawker stall. Instead, Mr Yap said it is his sense of responsibility and his love for his job that drives him. 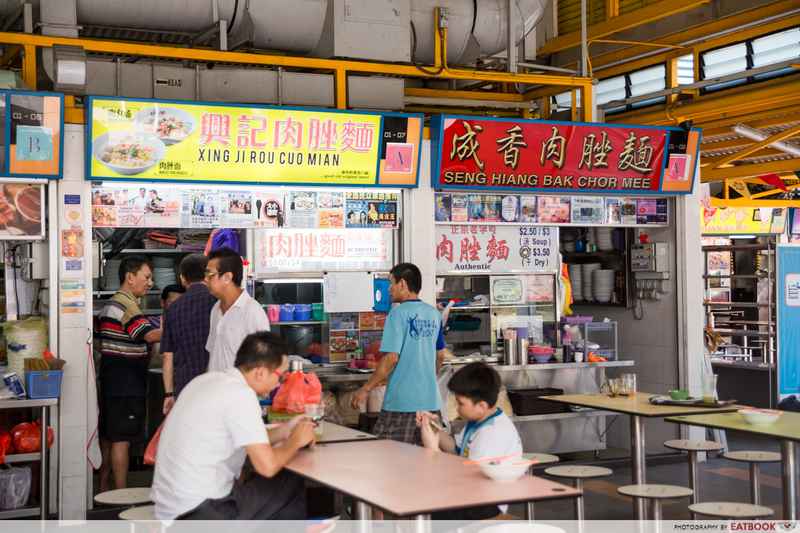 Seng Hiang Bak Chor Mee is also run by a pair of siblings – Mr Chua Yi Ok and his sister. Seng Hiang used to be in Changi and relocated to Fengshan Centre in the same year as Xing Ji. 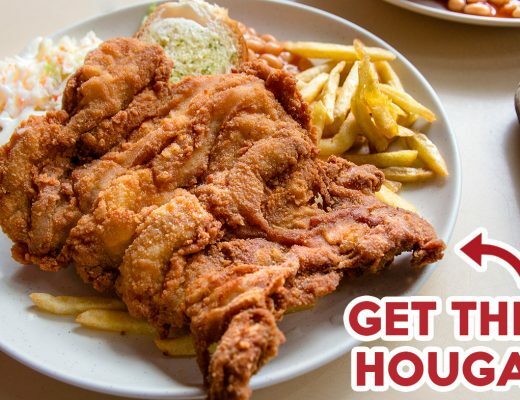 Opened by Mr Chua’s parents, Seng Hiang started out by selling you tiao and char kway teow, before replacing the latter with satay and bak chor mee in the ‘80s. According to Mr Chua, char kway teow was taken off the menu as it was taxing to prepare the greasy dish in the small stall, so the family opted for satay and bak chor mee instead. When his elder brother handed the business to him, Mr Chua felt a duty to keep it going. He works from about 2pm to 1am daily. Despite the long hours, he has no plans to stop anytime soon. “We have no choice, we are not highly educated. When time comes we’ll also pass [the business] to our children,” he added. 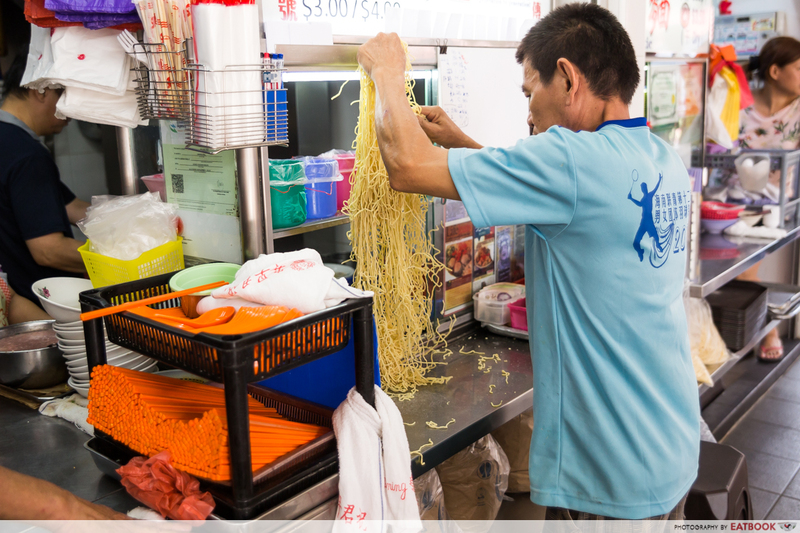 For their noodles, Mr Chua said it’s made from a recipe he and his brother came up with. 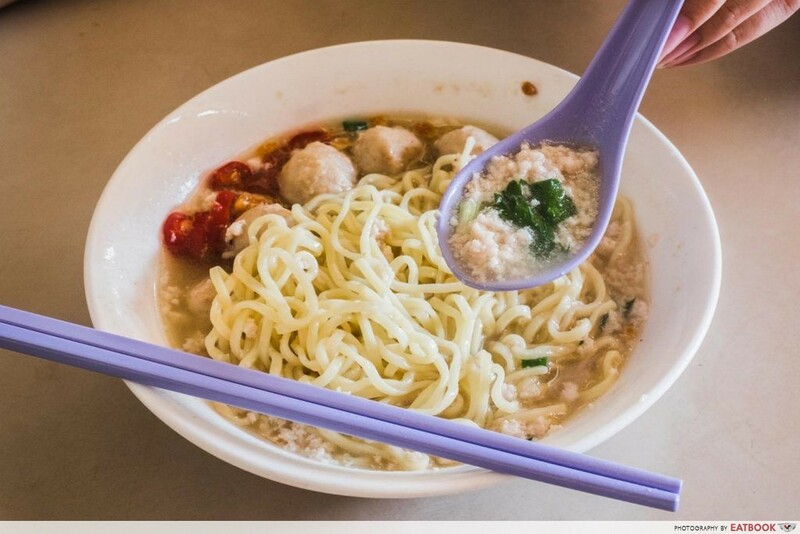 The bak chor mee at Seng Hiang used to only consist of minced pork and wonton. 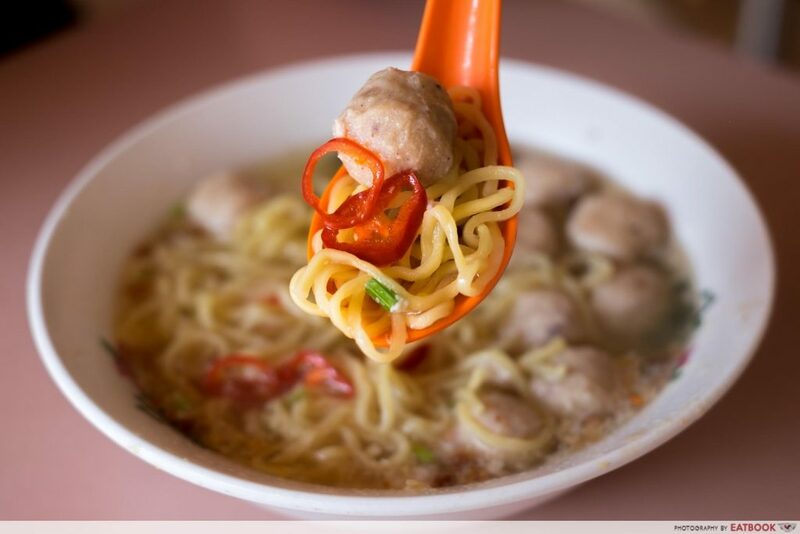 Mr Chua felt the dish needed something to make it look more appetising, so he replaced wonton with pork balls. Mr Chua chooses to focus more on food instead of competition. He believes in making good food that is affordable for everyone. “When people say [our food is] delicious, we feel happy,” he said. Xing Ji’s soup is made from pork bones, and simmered for three to four hours every morning. The piping hot bowl of umami-filled bak chor mee ($3/$4) had a strong pork flavour, and it is refreshing to have on a rainy day. Compared to Seng Hiang, this wasn’t as heavily seasoned and better for people with a lighter palate. The noodles were firm and springy, and had a subtle eggy taste. It tasted similar to Seng Hiang’s, so I wouldn’t be surprised if they came from the same supplier. They were also more generous with the meatballs, which were pretty standard. Seng Hiang’s bak chor mee soup ($2.50/$3) looked distinctly different from Xing Ji’s. Their soup looked richer, and they were more generous with the minced meat. Taste-wise, the difference between the soups were world’s apart. Seng Hiang’s version was more heavily seasoned, and had a strong garlic flavour. Mr Chua mentioned the soup is made from pork bones, garlic oil, marinated minced meat, deep-fried pork lard, as well as loads of raw and deep-fried garlic. He boils the soup for over an hour daily. The noodles here were firm to the bite and their meatballs were, like Xing Ji’s, pretty ordinary. 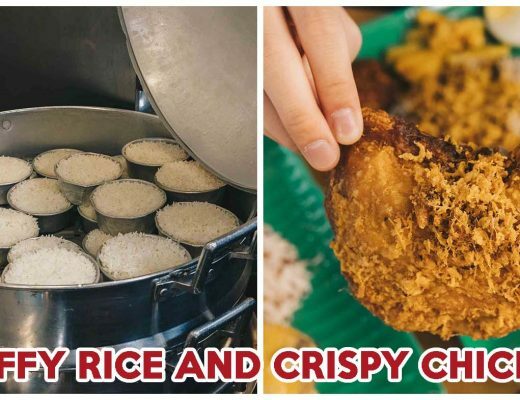 What sets Seng Hiang apart from Xing Ji is that Seng Hiang offers both dry and soup versions. 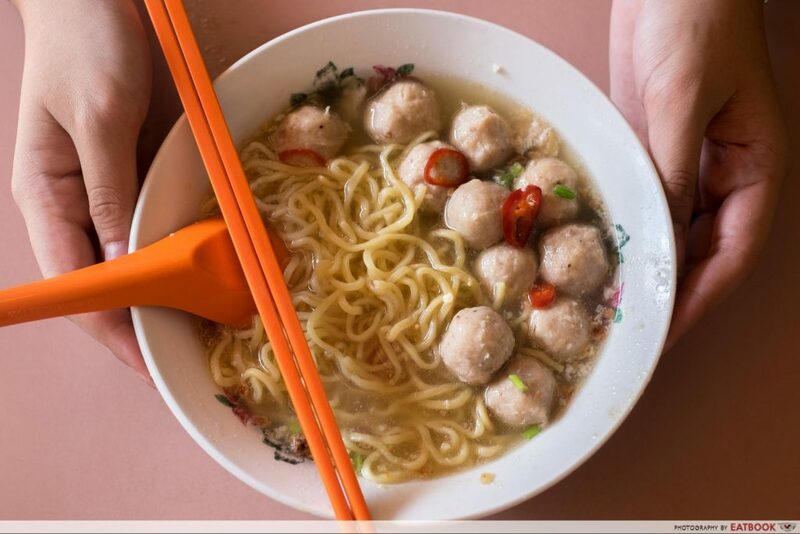 Seng Hiang’s dry bak chor mee ($3.50) is tossed in a house-made chilli paste, and you’ll also get a bowl of soup with meatballs. The chilli paste is made with sambal and pork lard. It had a good balance between spiciness, sweetness, and saltiness. Without overwhelming the palate, the spiciness was able to come through at the back of my throat. Both stalls have the same components, and the only significant difference would be their broth. Xing Ji’s broth was lighter and more refreshing, while Seng Hiang’s carried an exceptionally strong flavour of garlic. It’s easy to see why both stalls attract long queues – their soups appeal to two different types of palates. At the end of the day, it’s really up to you to decide which broth you prefer, and which stall you’d willingly sacrifice half an hour to queue for. For more interviews with hawkers, check out our features of Jin Ji Braised Duck and Sun Kee Drinks!